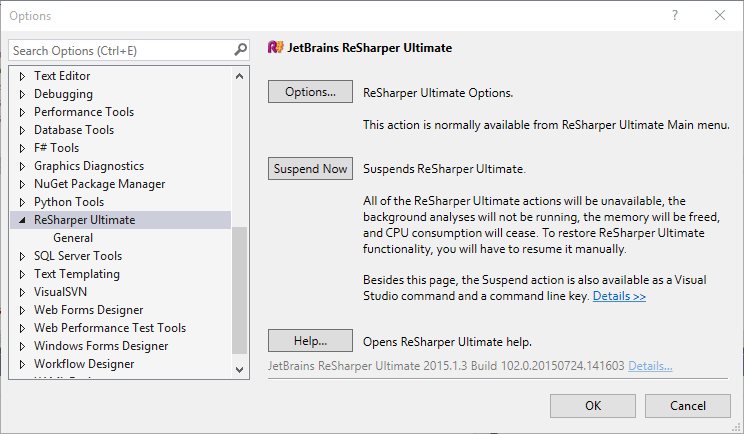 How to temporarily disable or turn off ReSharper in Visual Studio 2015 ? ReSharper is one of the popular productivity tool for the .NET Developers which provides some fantastic functionalities. There are times when you might want to disable or suspend it from Visual Studio 2015 . ReSharper can be suspended or even resumed (after suspension) by following the below steps. 1. Launch Visual Studio 2015 . 2. Navigate to the menu “Tools -> Options -> ReSharper Ultimate -> General” dialog. 3. In the General dialog , click the suspend button as shown below. When you suspend ReSharper , All of the ReSharper Ultimate actions will be unavailable, the background analyses will not be running, the memory will be freed, and CPU consumption will cease. To restore ReSharper Ultimate functionality, you will have to resume it manually.